Does Human Nature Rule Out a Better World? Despite the past century’s extraordinary advances in technology and scientific knowledge, today’s world is still racked by economic insecurity, vast gulfs between rich and poor, violent conflicts, and daunting environmental challenges. Is there a human nature that limits how much we can hope to better our world? Do psychology, evolutionary biology, the long view of history, and economics offer insights into what’s possible? 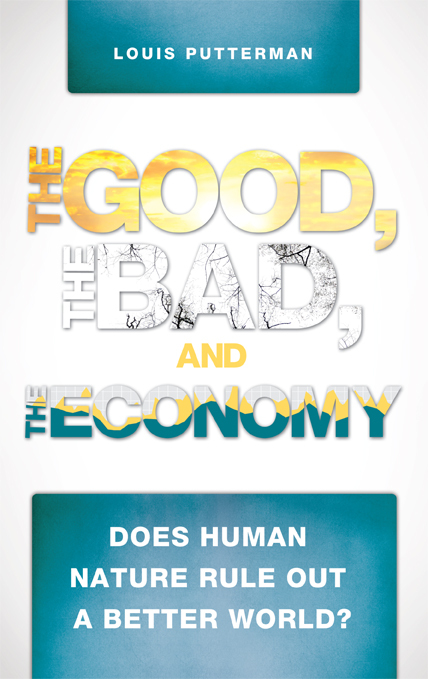 In The Good, the Bad and the Economy, Brown University economist Louis Putterman addresses these questions, making the latest experimental studies of decision-making in complex social environments, and up-to-date evidence on the impact of history on today’s economic gaps, accessible to the non-specialist reader for the first time. Reading it will change the way you think about our world and what’s needed to leave a better one to our children.